KIEV, Ukraine -- Protesters gathered at Kiev's Independence Square Sunday to march for peace, while fighting in Ukraine's east claimed more victims. 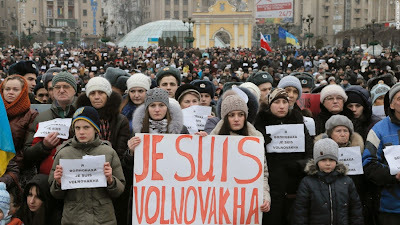 Ukraine's President and prime minister were among those who attended the rally that had as its slogan "I am Volnovakha," in memory of the 13 passengers who died near the city of Volnovakha after their bus was hit by artillery shelling on January 13. "We will remember every Ukrainian hero who gave (life) for the sake of independence, sovereignty and territorial integrity of Ukraine," said Ukrainian President Petro Poroshenko. "We will not give up a single meter of our land." Meanwhile, fighting in the east continued. Government forces and pro-Russia rebels have been battling for control of eastern Donetsk and Luhansk regions since April, after Russia annexed Ukraine's southeastern Crimea region the previous month. The Ukrainian army was able to regain full control of the Donetsk airport, military spokesman Col. Andriy Lysenko said Sunday. Over the last 24 hours, four Ukrainian soldiers were killed and 32 were wounded, the spokesman said. A 7-year-old boy and a 16-year-old were killed when a missile struck a house in the town of Vuhlehirsk, in Donetsk, said Donetsk's regional police chief Vyacheslav Abroskin on his Facebook page. A young girl was seriously injured. A ceasefire deal was reached on September 5 in Minsk, Belarus, following talks between representatives of Ukraine, Russia and rebel leaders. A subsequent agreement on September 19 set out more measures, but there has been little sign of progress as all sides blame each other for the bloodshed. The United Nations issued a statement Sunday, calling on all parties to exercise restraint. "The Secretary-General is alarmed by the severe escalation of fighting for control of Donetsk airport in eastern Ukraine, which has already caused numerous casualties and threatened to completely unravel a hard-won September 2014 cease-fire," it read. The statement continued: The Secretary-General stresses that further deterioration of a situation that has led to heavy loss of life and civilian suffering must be avoided at all costs. The United Nations stands ready to support all efforts toward de-escalation and the resumption of a genuine peace process to restore Ukraine's stability and territorial integrity.